A configuration profile allows defining and centrally managing consistent configuration settings, which prevents configuration drift. Configuration drift happens over time as changes are made on a manual rather than an automated basis, and the changes are applied in an inconsistent manner. Configuration drift contributes to failures with high availability and disaster recovery efforts. If a configuration change is made outside of the Lifecycle Manager application, running a configuration job within LCM overwrites the configuration on the job targets; ensuring that the clusters, datacenters, and nodes are running as specified in the applied configuration profiles. Configuration profiles inherit intelligently within the cluster topology. For example, if a config profile is not explicitly specified at the datacenter or node level, the configuration profile is inherited from the cluster level. When creating the cluster topology model, defined configuration profiles can be applied at the cluster, datacenter, or node level. A configuration profile at the node level takes precedence over datacenter or cluster level profiles. Define configuration profiles that reflect the requirements of the workload node type in a datacenter. Does not explicitly specify a commitlog directory, instead relying on the default value of /var/lib/cassandra/commitlog. DC1 has no config profile of its own and therefore inherits its config profile from its cluster. DC2 has a defined config profile at the DC level that specifies a maximum heap size of 32 G, and a commitlog directory of /cassandra_data/commitlog. All nodes in DC1 inherit cluster settings: g1gc; 16 G max heap size; and uses the default commitlog directory of /var/lib/cassandra/commitlog commitlog directory. Nodes in DC2 inherit from the cluster and also override cluster settings with the datacenter-level config profile: g1gc (inherited from cluster); 32 G max heap size (DC config profile takes precedence over an explicit setting in a cluster-level config profile); /cassandra_data/commitlog commitlog directory (DC config profile takes precedence takes precedence over an implicit default inherited from a cluster-level config profile). The inheritance and precedence of config profiles allows keeping a cluster consistent by inheriting as much as possible from a cluster-level config profile, while also providing the flexibility of specifying only the granular settings that differ in higher precedence within config profiles applied at the lower, more granular datacenter and node levels. 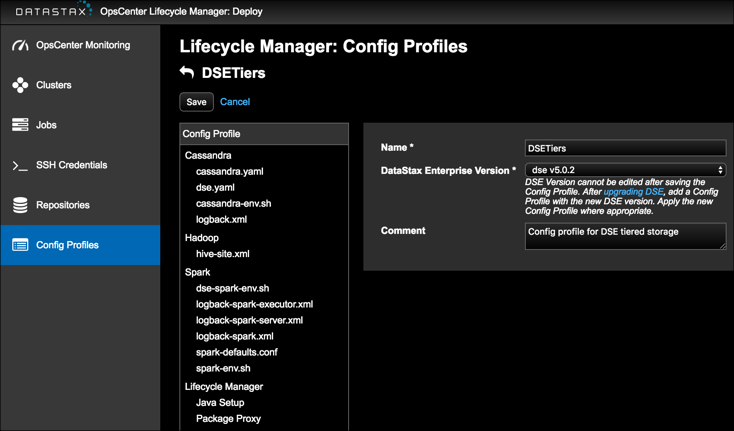 Note: When you add a configuration profile, DSE authentication is enabled by default for all supported versions of DataStax Enterprise. DSE Authenticator is enabled for DSE version 5.0. For more information, see Managing DSE Security using LCM. Java Setup: Automatically manages JRE installs and JCE Policy files. Package Proxy: Accelerate package downloads or isolate DataStax Enterprise clusters offline from the internet. Every configuration option in cassandra.yaml and dse.yaml is editable, while other configuration files use a template system that exposes only frequently used settings. Contact DataStax Support to request additional configuration options. A configuration file explicitly not managed at this time by Lifecycle Manager is commitlog_archiving.properties, which is used for configuring commitlog archive and PIT restore for the Backup Service. This file is managed instead from within the Backup Service.